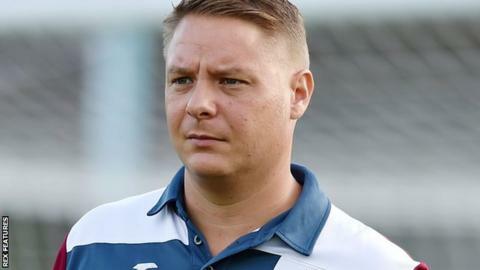 Truro City manager Leigh Robinson says his side's fortunes might improve if they drop back into the National League South relegation places. City are just a point above the drop zone after losing 3-0 to Chelmsford. "Perhaps getting closer to the relegation zone, or even going in it, might not be a such a bad thing," Robinson told BBC Radio Cornwall. "Once you've got that cushion then you're always thinking 'we'll be alright' and 'there's always tomorrow'. He continued: "Getting that little bit closer to it. let's hope. will spark a reaction from us and we'll be able to to pull ourselves away." Truro have drawn two and lost four of their last six games, including the three-match losing run they are currently on, eradicating an eight-point buffer above the bottom three they had a few weeks ago. "At the minute we seem to be a bit of a soft touch defensively, and when other teams get into attacking areas they seem to never fail to put a good ball into the box and all of a sudden it's into the back of the net," added Robinson. "We seem to be quite wasteful in the final third with the balls we put into the box. "If you're going to get out of trouble, stop conceding goals and keep cleans sheets, you need to be able to out the same defensive unit out there and we cannot seem capable of doing that at the minute."